Arup is supporting clients across the world to meet rising demand for this transitional fuel. LNG is playing a vital role in keeping our world powered. Being a lower carbon fuel, global markets continue to open up and demand is outpacing supply. Arup is helping this rapidly growing industry to drive improvements in storage solutions, from lower-cost, higher capacity tank designs to the technical advice that can unlock investments in new infrastructure. As LNG gets closer to being a commodity, one traded like oil, we foresee further expansion across the industry, with new players demanding high performance infrastructure to meet growing demand. Arup has pioneered the design of high performance LNG tanks that reduce the weight, at costs up to 20% below conventional tanks. We use prefabrication to lower risk and improve safety, always using locally sourced materials and labour where possible. Click on the heading to read our report on the future of LNG storage, to learn more about our research. We have long experience in evaluating FSRU for near shore and deep water environments, as well as fixed onshore facilities. We design offshore liquefaction facilities and FPSOs. Our multidisciplinary team are experts in developing floating LNG from concept to build too. LNG to power is a relatively rapid way of adding significant capacity to the grid. We work with clients to provide technical and advisory services on various side programmes including small to midscale. We’ve worked on numerous commissions across Asia and the US including scoping works, detailed design and funding advisory services. Onshore facilities comprise of a number of complex factors from pipelines, to storage and transportation. Our experienced global LNG team have worked on a number of innovative programmes of work for clients including small to midscale. We work with clients to deliver low risk solutions whilst being cost efficient. New technology allows for new approaches, processes and tools meaning we can offer clients greater certainty and lower project risk across the LNG sector. We use the latest advanced digital engineering tools and approaches to assess and design every kind of LNG structure: from steel, concrete, hybrid fixed platforms to storage tanks and FPSOs. Our work on Ichthys LNG saw the largest subsea structure ever laid on the seabed, for the biggest discovery of hydrocarbon liquids in Australia in 40 years. We bring these new technological approaches to extend the life of existing facilities as well as to adapt designs to deal with varied seismic conditions. Our team undertakes the design, review, inspection and construction management of a wide variety of LNG marine facilities. Our specialists bring insight and understanding to the complex metocean and ship-shore interfaces that LNG demands. Our advice allows clients to understand the process end-to-end, from a site’s structural performance through to the potential shipping logistics. In the last two decades, Arup has worked on over 150 LNG programmes, from storage solutions, to near-shore and offshore LNG infrastructure, LNG-to-power and on-shore infrastructure. We support clients with transaction advisory services through to the concept design and structural engineering of the infrastructure itself. In every role, we draw on our wide global experience in geotechnics, process engineering, advanced digital engineering and the many related disciplines that LNG projects demand. From generating supply to meeting demand, the LNG market is vast and complex. Most markets face the same opportunities and challenges across the entire supply chain. 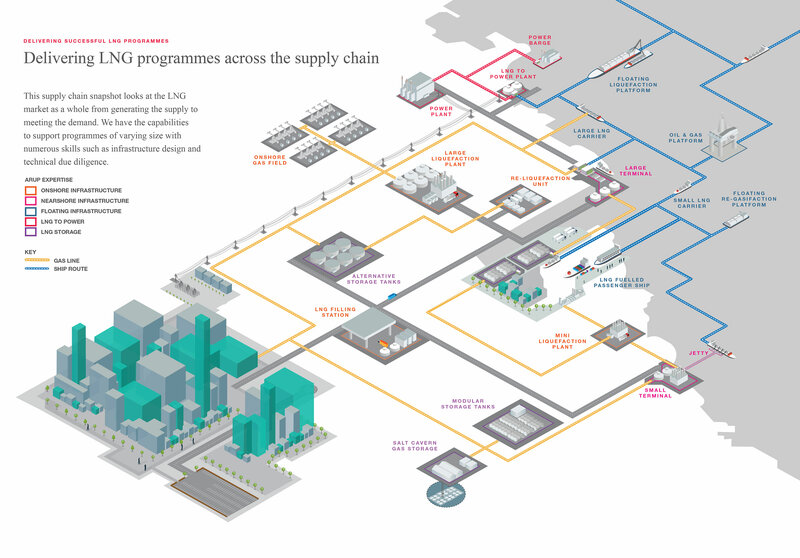 Our snapshot looks at LNG from source to consumer and the journey it takes from onshore pipelines to storage. The snapshot looks at our areas of expertise in the market – an area we can support clients in to reduce complexities and deliver high value outcomes. Asset operators rely on the latest engineering insights for project success. That’s why on many major capital projects, we work as the owner’s engineer, becoming part of their team to manage FEED or the execution phase of a project. In this role we provide technical and delivery oversight and support, ensuring that our client gets a finished utility that produces the intended project performance and level of financial return. What does the future hold for LNG across Asia? Liquefied natural gas production and transportation is at an all-time high in Asia, creating new opportunities to innovate and develop more cost-effective solutions. Find out how flexible infrastructure solutions can help deliver LNG storage with high value outcomes, including shorter construction time and cost reductions. The LNG market is predicted to grow by up to 46% over the next decade. With work on over 150 LNG programmes in all key market areas, we work with clients to deliver a variety of solutions. Our advisory team are helping LNG clients across the world to manage risk and maximise return on investments, taking account of local market variables and global price trends. We back advisory insights with an end-to-end understanding of the sector and the factors that continue to shape it. We provide accurate and independent technical feasibility studies, allowing us to stress test business cases. Clients then benefit from well-structured and secure financing.